As I mentioned before, we are in the midst of a living room makeover. We began painting Saturday. We chose a shade of white called "Betsy's Linen". 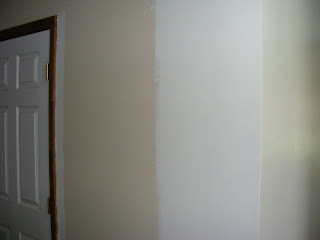 Our room was prety neutral already so I didn't think there would be that much difference. But as you can see, things are getting lighter and brighter! Our hallway is noticeably brighter now. I'm anxious to see how the lighter paint affects the living room as well. I think the removal of the blue carpet will help too. OH! You have been tagged!! Details here!